We have read a story, aimed at younger children, called "Clickin' Chicken". The story was about a young chick which hatched from an egg next to a farmer's house. The chick was curious, so entered the farmer's house and found a computer. She started buying really expensive items. Then she got bored and decided to go in search of a friend... ONLINE! She found a picture of a really nice looking boy chick which she wanted to meet. She arranged to meet him, without telling her parents. She met him in the most deserted area possible and he turned out to be a wolf! We assume that it ate her. I learnt that meeting people online is dangerous and you should never do it. If you think it's a friend - still always tell your parents first. Make sure you have a long password (but not too long!) with at least 8 characters, symbols, numbers and a mixture of capital and lowercase letters. Make sure you know who you are accepting on games, social media and other communication platforms. Remember, not everything online is true! If anything does go wrong or you become suspicious - TELL A PARENT OR GUARDIAN. A Children's Programme about staying safe online. 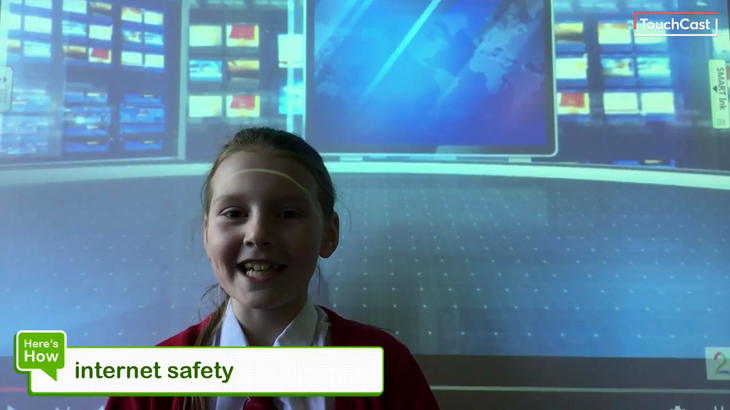 Sophie wrote and directed a news programme for children about the dangers of going online and how children can keep safe if they do go online.